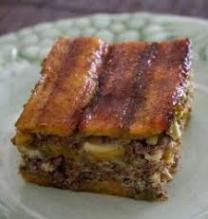 Piñon o Pastelon de Platano (Sweet Plantain Meat Pie) - Tienditadepuertorico.com - Buy Puertorican Food Here!! Warm 2 tablespoons oil in skillet over medium heat. Sautee sofrito until fragrant, one or two minutes. Cook over medium high heat until browned. Stir in tomato sauce, capers, olives, oregano, cumin. Stir in pique,vinegar and wine (if using). Lower heat, cover, and simmer for 20 minutes. Heat 1 inch of frying oil in skillet over medium heat. (check tenderness by poking with toothpick or fork). Carefully remove plantains from oil and drain on paper towel lined plate. dish just create more layers). Spread half egg batter over bottom of dish. Top with half of plantain slices (about 12). Spoon meat mixture over plantains to cover. Top with an even layer of vegetables. Top with remaining plantain slices. Evenly pour remaing egg batter over dish.